Here's the third part of my "Making of"-series, and this one is all about putting a Rag Pet together, quite literally! You can read the earlier parts of this series by clicking on the "Making of"-tag in the side panel there on the right. 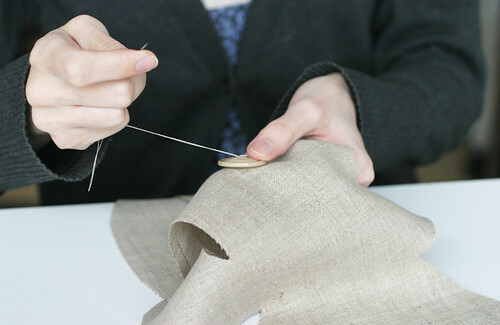 After a Rag Pet has been cut out, it's time to attach their tail, sew on their bellybutton and give them a face. I use a ladder stitch (or mattress stitch, as it's also known) to sew the tail on to the Rag Pet's bum once the tail has been stuffed. The ladder stitch is one of my most favourite stitches in the world, because it's just pure sewing magic, being completely invisible once it's done. It's the most perfect thing for attaching Rag Pet tails, or closing openings left for turning. Once the tail is sewn on, I pour out my button jars and lovingly shift through all my lovely buttons looking for just the perfect bellybutton. I've waxed poetic about picking bellybuttons (and my -very slight, mind you- addiction to buttons), and since then, nothing much has changed, except that instead of one big jar full of buttons, there's now two big jars full of buttons! After the tail and bellybutton are done, I give the Rag Pet a face. I usually start off by giving them blushy cheeks. I use a Copic marker airbrush to do the blushing, although occasionally I simply draw it on with the markers if I'm not wanting to get all the bits and pieces set up for the airbrush. Then I put in the eyes. In the very beginning of making Rag Pets, I embroidered the eyes, then after a while started using teeny tiny buttons, and then I found teeny tiny safety eyes (I heartily recommend 6060 on Etsy, they have a really super selection) and I've been using them ever since, even if they are a bit of a pain in the fingers to put in; I use pliers to push the washers set real tight. Despite how cute safety eyes look on a finished soft toy, they do look a little creepy when seen from the reverse. The final facial feature to get done is the nose, which is simply embroidered on with a few stitches. I use iron-on interfacing on all the Rag Pet bits that have something sewn (or in the case of the eyes, pretty much bolted) to them to make that spot more durable and stronger. It's good to cut the edges of the interfacing with pinking shears so their edges won't show through as well as if the patches' edges were just cut straight. Then it's time to pin the front and back pieces together and sew them up! The guideline I drew when I traced the pattern is a great help in getting the seam just so. This is the second part of my "Making of a Rag Pet"-series, the start of taking the design off of the page and making it tangible. You can read the first part of this series here: Designing a Rag Pet. 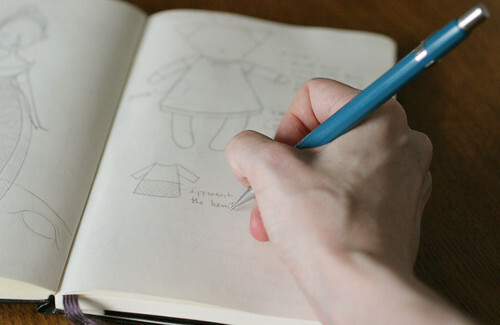 Making a design into an actual, huggable Rag Pet usually starts off with picking fabrics, if the original idea didn't come from a specific fabric to begin with that is. Although, most of the time I already have a notion of what materials I want to use when I work on the design. For this example rag-cat (please keep the name suggestions coming, I've gotten some brilliant ones so far! ), I know I want to make her out of linen, as it's one of my most favourite materials and really lovely to work with besides. I haven't yet decided exactly what fabrics to use for her outfit, but I do have an idea of what I'm going to go with there. Because deep down I'm pretty lazy, I try to do things as simply and easily as possible. Also, doing things properly and precisely the first time 'round means not having to do it all over and over again to get everything right and that of course means less work over all. 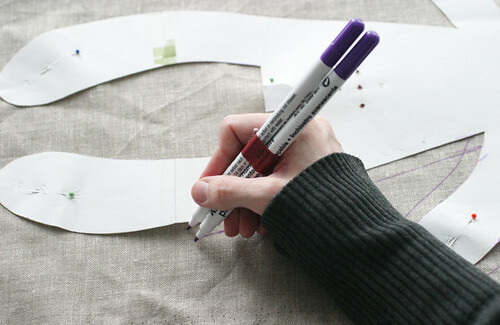 This has resulted in a bunch of little tricks to save time and effort, like taping two fabric marking pens together so I can draw the seam allowance at the same time I draw a guideline for where to sew. Having an uniform, consistent seam allowance is -to me at least- really important. 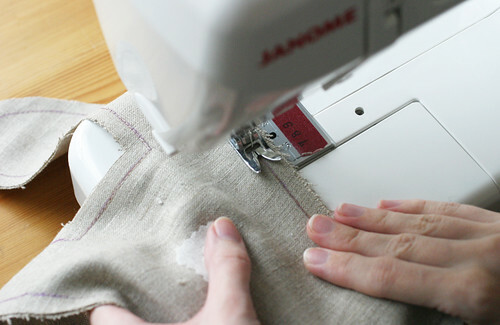 It makes it easy to align pieces together and to sew each bit exactly where it should be sewn, especially when the pieces aren't of the same shape, for example when attaching a sleeve to the bodice or similar. Having a good seam allowance also prevents your sewing project from coming apart should the edges fray a bit. 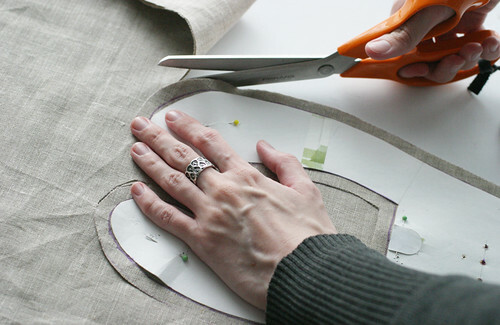 Once the pattern has been traced onto the fabric, it's time to cut it out. I could go on and on about my scissors, which I am quite particular about! 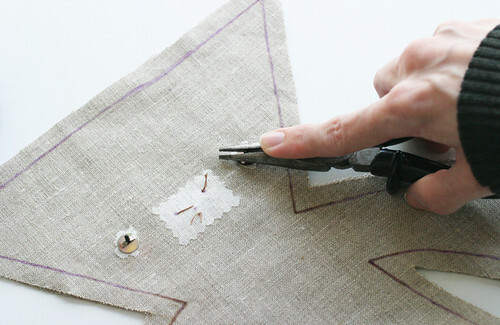 I have scissors for cutting paper, scissors for cutting fabric and clippers for cutting thread and I never ever use them for other materials than the ones they're designated for. That way the blades stay nice and sharp for ages. My beloved fabric shears are by Fiskars and like I said, I treat them with the utmost of respect. They've served me very well for, well gosh... over ten years now and I intend to keep them nice for at least as many years yet to come, because good scissors make cutting easier, which, again, saves time and effort. So remember, treat your scissors well and they'll treat you well in return! You might have noticed the little "It takes about 15 hours to make a Rag Pet"-trivia at the bottom of the Rag Pet Shop page, and now that the shop is up and running I thought it pertinent to give a look behind the curtain and show what takes up those aforementioned 15 hours or so. Also, I really like the making of documentaries of films and all those "How is thing-XYZ made"-shows on Discovery Channel and thought it'd be fun to do my own. Once I do have an idea, I usually sketch it in my sketch book, since I like to think aloud -or on paper as the case might be. It's easier for me to work on a design when I can actually see it. It's also nice to have a record of what ideas have made their way out of my head over time. 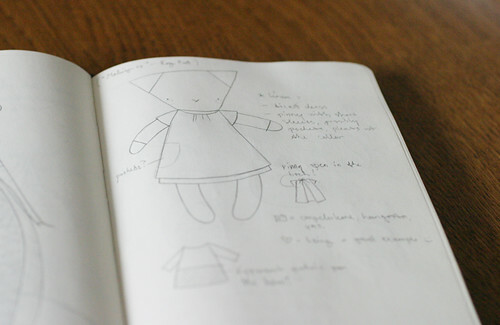 For this series of blog posts (as this will be a series documenting the making of a Rag Pet from start to finish, just follow the "Making of"-tag for the whole, eventual thing) I'm making a rag-cat whose design sketch you can see in the photos here. I haven't come up with a name for this example rag-cat yet, but now that I'm thinking about names, I'll mention that occasionally inspiration can come from them too; I'll hear a nice name and want to make a Rag Pet to match. Alas, I have no idea what to name this rag-cat, and thus I'd like to ask if any of you have any ideas as to what she could be called? It's the time of Easter eggs, and especially of chocolate eggs and fluffy chicks and bunnies. We haven't much celebrated Easter, to be honest. Asides from eating lots of chocolate egg, pasha and in J's case, mämmi (a traditional Scandinavian Easter treat), that is. I was going to make a much bigger production of Easter, and make a special Easter rag-rabbit and all, but I've been sick with an exceedingly persistent case of the flu and rather stuck in bed being miserable under a mound of blankets. I'm on the mend now at least, and very much hoping that this really infuriating flu would pack it's bags and leave me be very soon! There are still some Easter rag-rabbits in the shop though: Take me to the bunnies! 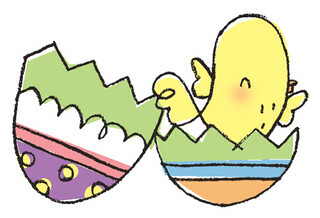 I wish you all an eggcellent (pardon the pun, I simply could not resist!) Easter!